The world has seen Africa’s digital future advancing by leaps and bounds in the adoption and use of information and communication technologies (ICTs) in the private and public sectors. What makes this more interesting and promising, is the level of investment and growth of women Engineers in recent years making headlines. The Gambia has seen much of these developments in recent years with examples of inspiring women Engineers like Mrs Anna Secka Saine who has contributed in building many backbone Networks in Africa such as, Internet eXchange Points (IXPs), National Research and Education Networks (NRENs), and, as well helped trained many young and Professionals engineers. We have also seen rise in the number of Computer Science clubs, after school coding, summer coding camps, Robotic clubs among others, which all projects the level of awareness and interest. 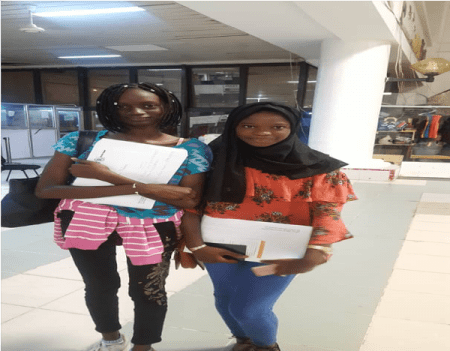 In August, two brilliant young Gambian High School science students, Sera Momodou Ndure and Ajie Isatou Ceesay from Marina International School (MIS) and West African International School (WAIS) respectively represented The Gambia at the Africa Girls Can Code Initiative (AGCCI2018) in Addis Ababa, Ethiopia. The Africa Girls Can Code Initiative (AGCCI) 2018-2022 is an Africa Wide Initiative being developed and implemented by the U Women and the International Telecommunication Union (ITU), in Collaboration with the African Union commission (AUC) and Sponsored by the Danish Government. The aim of the AGCCI is to help promote STEM and equip young high school girls with Digital literacy, Coding, Critical thinking and mentorship to be future African Digital Innovators, entrepreneurs and Policy leaders. The training gathered over 80 girls from across Africa who all underwent a two weeks intensive training on gaming, animation, fashion and art, design thinking and robotics, among other themes at the African Union Commission Headquarters from the 20th – 31st August 2018. Participants also had the opportunity to meet great leaders and visited the Ethiopian Ministry of Science and Technology and the Bole international Airport where they were given chance to explore Aviation Technology. In attendance to welcome and cheer our Gambian participants were: The Gambian Ambassador to Ethiopia – HE Ambassador Sulayman Alieu Jack, Mr. Almami Kassama, Deputy Head of Mission and team. Our Director of the Internet Society Africa Regional Bureau Dr. Dawit Bekele also joined the delegation in giving the girls a warm welcome to Ethiopia as well as meeting His Excellency the Ambassador and delegates. Other speakers at the event included Letty Chiwara – UN Women Ethiopia Country Representative, H.E. Amira Elfadil Mohammed Elfadil – Commissioner for Social Affairs at the AU and Andrew Rugege from ITU who encouraged the girls to learn as ICT is the solution to Africa’s prosperity. The Internet Society Gambia Chapter is proud for the recognition and is pleased to have been very supportive in nominating and selecting these brilliant girls with the support of Mrs. Jamilatou Saidy Faye – Senior Manager Consumer Affairs at the Public Utilities Regulatory Authority (PURA) and the officials of The Gambian Embassy in Addis Ababa for coordinating the necessary logistics for our participants. As new members of the Internet Society and The Gambia Chapter, we hope to continue guiding, mentoring and supporting our AGCCI 2018 participants to continue this amazing journey and to be ambassadors of the AGCCI and Internet Society by sharing their experience with fellow young women and students in The Gambia. As Governments and International organizations like the ITU, AUC, UN Women, Internet Society among others continue to step forward with these strategic initiatives to support the grassroot community, we believe that there is hope that Africa will be able to solve its problems by Africans themselves!